Gustavo Dudamel accents the colors, rhythms, and passion of music by leading composers from Argentina in this invigorating evening. Dudamel Conducts Tangos Under the Stars with the L.A. Phil was recorded at the Hollywood Bowl in 2016. 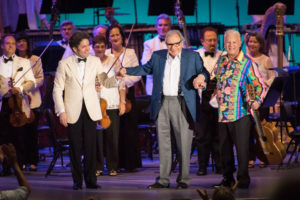 With guitarist Angel Romero, bandoneon player Seth Asarnow, and dancers from Tango Buenos Aires, maestro Dudamel leads the Los Angeles Philharmonic in works by the Astor Piazzolla, once described by Stephen Holden in The New York Times as “the world’s foremost composer of tango music”; symphonic composer Alberto Ginastera, who was Piazzolla’s teacher; and film score composer Lalo Schifrin (Mission Impossible). On CPTV: Friday, March 31 at 10 p.m.